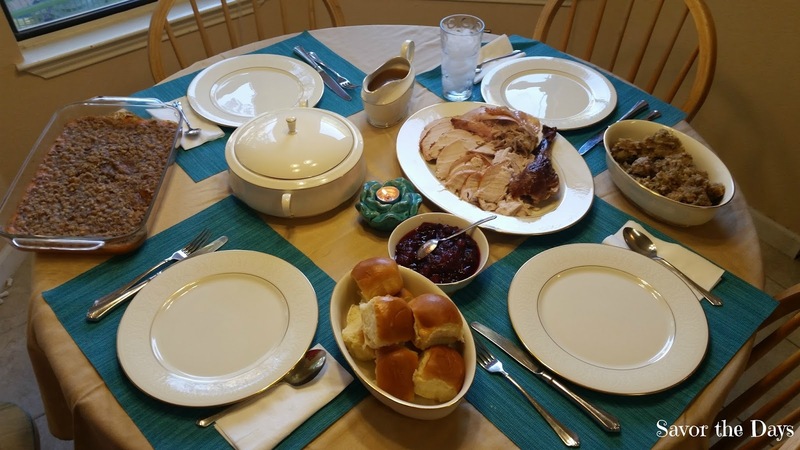 Although we don't have any family in our area, we always cook a traditional Thanksgiving meal. Sometimes we've been able to invite a friend over who needed some company but usually it is just the four of us. That's fine too...more leftovers for us! The only thing I hate about our Thanksgiving meal is the FIVE cups of onions that have to be chopped for the dressing. 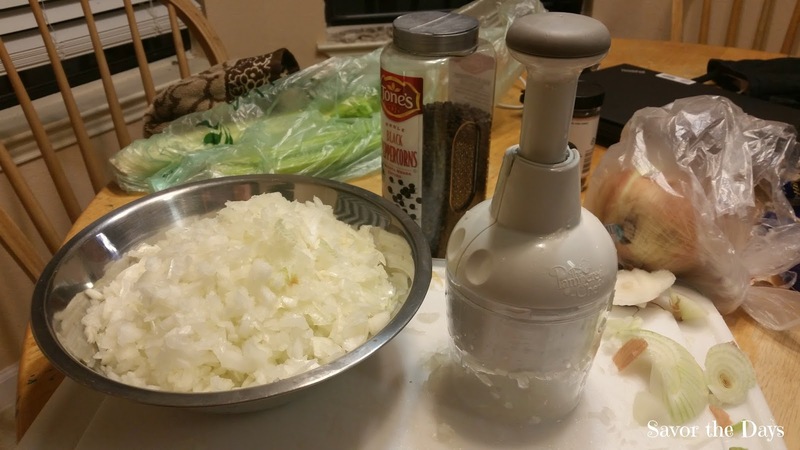 I use my Pampered Chef food chopper to make it go more quickly but there are still a lot of tears. We have found a brined turkey recipe that we absolutely love. 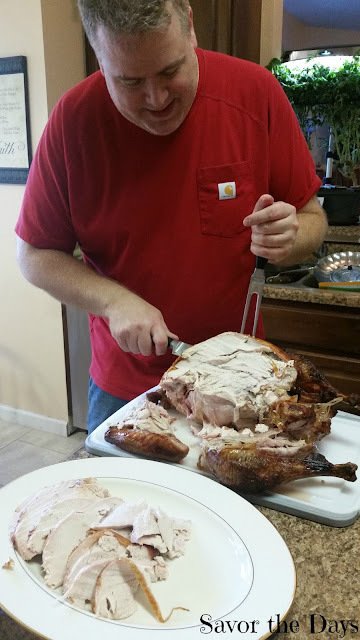 It makes the most flavorful and moist turkey you will ever eat. It is Alton Brown's Good Eats Roast Turkey recipe. The bird soaks in a brine solution overnight. 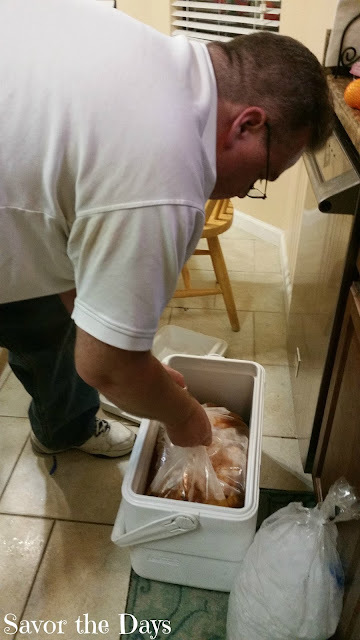 We put it all in a brining bag to keep all of the mess contained then we put that down into an ice chest and cover it with ice. It is all still ice cold in the morning when we take it out to cook. While the food was cooking, we enjoyed some family time and Nicholas built a crazy tall tower of Keva blocks. 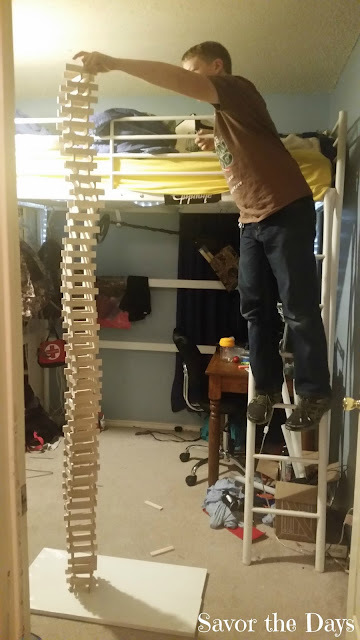 Fortunately the ladder to his loft bed helped him get high enough to keep building upward. We had to get creative with the oven cooking. 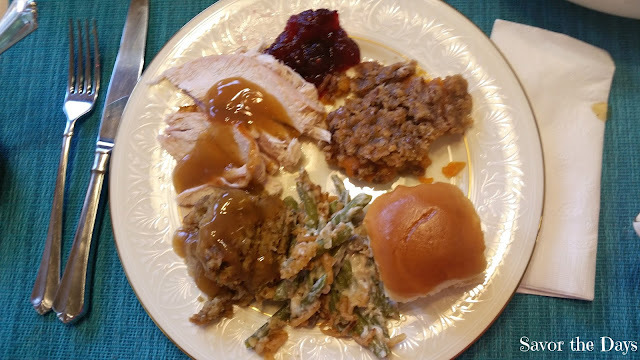 We only have one oven but had to cook the turkey, dressing, sweet potato crunch, and green bean casserole - all to be ready at the same time! Stuart has brought the dressing to work for their Thanksgiving potlucks and he says it cooks well in the crock pot for 4 hours so we got that started in the morning. Fortunately the turkey needs to rest after cooking so we cooked it by itself in the oven. As soon as it was done, we put the sweet potato crunch and green bean casserole in the oven. Amazingly it was all ready to eat at the same time! Yes, we even used the fancy china. Everyone cleaned their plate and some went back for seconds. 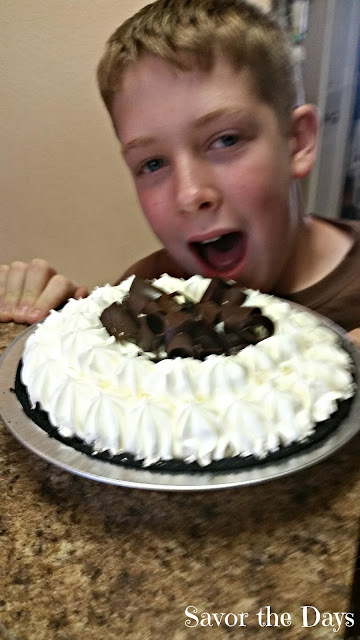 But we made sure to save room for the Chocolate Silk pie for dessert! 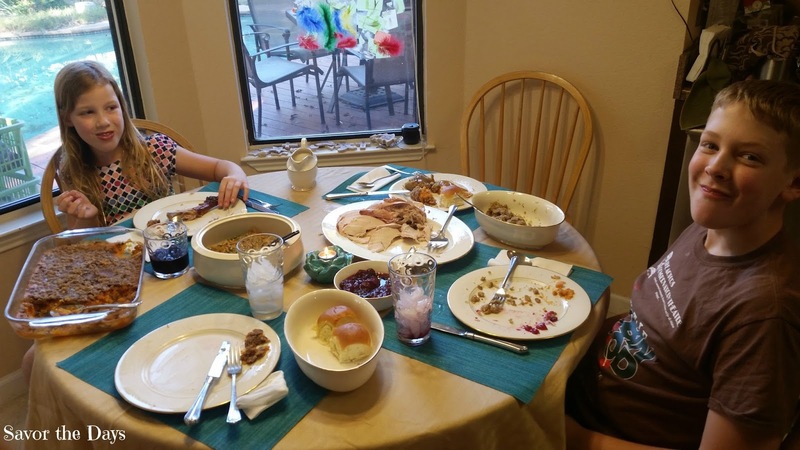 We talked a lot about all that we have to be thankful for this year. It has been a rough year for us. But we are thankful that Stuart wasn't injured in the wreck that totaled his beloved truck, my dad has recovered well from his 3 broken ribs and punctured lung, my in laws were rescued from their car as they floated down the street in the Louisiana flood, and my skin cancer has been removed and the biopsy shows that I'm cancer-free. 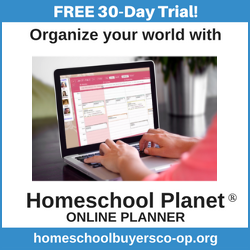 There are so many more things that we came up with to be thankful for. As we would talk about one thing, another thing popped in someone's head. It was a nice talk we had and a reminder of all that we have to be thankful for. 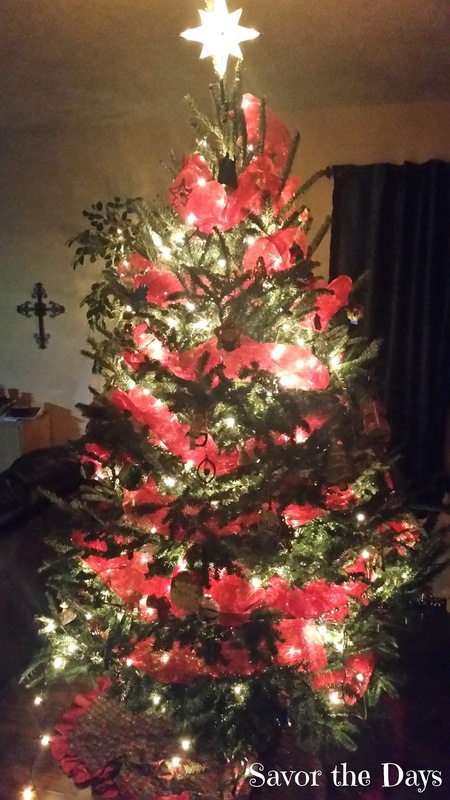 Last night, Stuart took the kids to the nursery department at Home Depot and they picked out the perfect tree. We spent the evening decorating it with all of our sweet keepsake ornaments that the kids have made over the years. 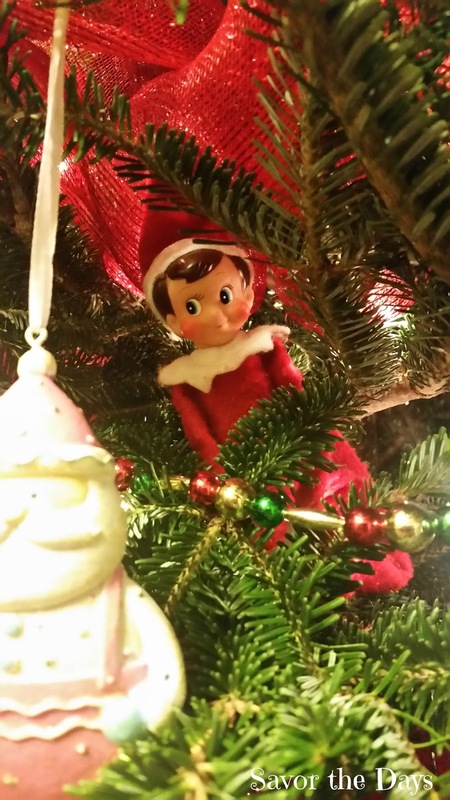 Rachel has been super excited to get the tree decorated because once the tree is done and the kids have gone off to bed, Chimney, our Christmas elf, appears somewhere on the tree for the kids to find the next morning. I can't wait to see her excitement when she finds him! What a blessed year it has been and it's not over yet! For Christmas is the time to celebrate the most amazing blessing of all, Jesus Christ, and the love He has for us.